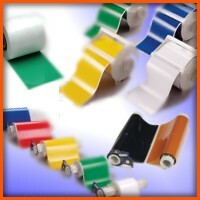 A widely used search term for Brady PowerMark printing material is "PowerMark Ink", though this ink is more commonly known as "PowerMark Ribbon", or thermal transfer ribbon for the PowerMark printer. PowerMark ink is only used in the PowerMark printer, and works only in conjunction with PowerMark sign vinyl. PowerMark ink ribbons are easy to load, and are available in a variety of colors, include multi-color paneled ink ribbons. These are some sample catalog numbers for commonly used Brady PowerMark ink ribbons. These are just a few examples of the ink ribbon supplies that are available for the Brady PowerMark label printer.